World leader in innovative and proven designs for low-cost transitional shelter. World Shelters continues to participate in ongoing relief projects in Haiti. See below for updates. We welcome your inquiries. World Shelters has been asked to prepare three different proposals for Medecins Sans Frontieres (Doctors Without Borders) for three of our transitional shelters, the TranShel, the U-Dome, and the TShel2. Medecins Sans Frontieres is pre-positioning transitional shelter inventory along with their field hospitals, for deployment following disaster. Their plan is to build settlements adjacent to their field hospitals to provide improved shelter for their discharged patients. World Shelters is honored and excited to have our shelters in consideration for this project, and we believe that the TranShel, the U-Dome, and the TShel2 would all be very well-suited to this purpose. All relevant elements of the proposals are available to view and download below. The TShel2 is one of our newest and most exciting shelters. 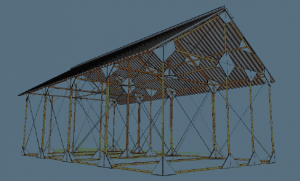 Designed to address the space and land availability problem faced by those living in densely-populated areas such as Haiti, the TShel2 is one of the only two-story transitional shelters of its kind. This shelter does not require a foundation, as it is secured to the ground through load-bearing anchors that are able to telescope up or down in order to keep the shelter above water in case of flooding. Its rectangular design and gabled roof makes it appealing to those who are used to living in a traditional Western-style house and the basic TShel2 can easily be painted or adapted in order to personalize the living space. The two-story design provides 18 square meters of interior space on only a 12 square meter footprint, making it ideal for families and for anyone living in an urban area affected by disaster. The TShel2 is also modular and can be combined with other TShel2s in order to create a larger conjoined living space; the shaded outdoor porch can be used as a kitchen or simply for socializing. 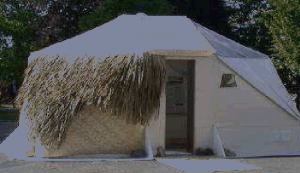 The walls are made of our lightweight yet durable and fire retardant corrugated polypropylene, and the shelter can withstand a 100 mile wind load with a safety rating of 1.5. It can easily be outfitted with composting toilets, solar panels, propane heating, and water collection cisterns in order to provide not simply shelter, but a complete safe, healthy, and cost-effective living environment. 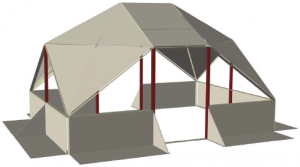 The TShel2 is a fantastic, ground-breaking shelter that redefines transitional housing for a densely populated environment, and we believe it has the potential for vast positive impact when deployed efficiently. The TranShel is a frameless hard-panel shelter designed to conform to international transitional shelter standards. With a rectangular floor plan and made of the same fire-retardant corrugated polypropylene as our U-Domes, the TranShel can be used as a standalone shelter or can be secured onto raised walls to create a roof for an even larger space. The basic unit has a floor plan of 18 m2, exceeds strength requirements, and is eminently reusable as well as recyclable. The TranShel was designed to be easily adaptable to combine our structure with local modifications and specified needs. All of these features come at a very low price-point, which makes the TranShel one of the best options available for international emergency transitional housing. To explore the photo album of the TranShel being assembled in Geneva, click here, and for more information or to download the TranShel engineering analysis, please see here. We now have the PDF file of the 2DK TShel2 as well as the sample sections available for download. You can find the PDF here ( 2dk-tshel2-all-south-facing-20110522), and the Powerpoint file of the sample sections here ( section-samples-materials-for-2dk-tshel2). World Shelters worked very hard to design the best possible shelter for the Japan relief effort, and although our designs were lauded and very well-received, the Japanese government and relief organizations made a conscious and wise decision to apply their funding to Japanese organizations instead. Orders for international supply never materialized for multiple reasons. Families balked at moving to new developments that were away from their neighborhoods, and families really wanted housing rebuilt that was similar to their prior house. The authorities recognized that it would be better to spend that capital within the Japanese economy; even though it will take more time, it’s better for the over-all economy to keep their capital local and to maximize input into the afflicted areas. World Shelters entirely agrees with this principle of self-sufficiency as an integral part of the relief effort and we are honored by the positive responses our designs received and happy to have contributed in whatever way we could. The design for the 2DK TShel2 has been finalized – please check out the slideshow for detailed images of this fantastic shelter! View more presentations from WorldShelters. The team at World Shelters has collaborated with Wernher Krutein Productions to put together a video to present the 2DK TShel2 design to the world. We are still in need of donations and support from individuals and suppliers in order to move forward with the construction of this new shelter as quickly as possible. Your donation today will allow us to take the next step in providing homes for the people of Japan. Watch the video now! Yesterday World Shelters received news that we are on the Approved Supplier List for the rapid re-housing project, released yesterday by the Japanese Ministry of Land, Infrastructure, and Transportation. This is a great step forward on the path towards getting our newly-designed 2DK TShel2 to the people in Japan most in need of new homes. The Approved Supplier List now goes to the group making the purchasing decisions for contracts to be placed between now and the end of May. Thanks to everyone at World Shelters who worked so hard to achieve this great milestone! World Shelters has submitted proposals to the Japanese Ministry of Land, Infrastructure, and Transportation to provide shelters in Iwate Prefecture; all of our staff and volunteers, but particularly the design team, have been working around the clock to make design and engineering modifications to meet the specifications set by the Japanese. Final decisions about the contract are expected within the next week. We have received very positive feedback while working closely with our Japanese partners and are very hopeful that the project will move forward. Everyone at World Shelters has been working extremely hard to proceed as quickly as possible to provide the people of Japan with shelters that are designed to be safe, comfortable, and culturally appropriate. Please help support our efforts to bring the best possible shelters to those in need in Japan – your donations make our work possible. Thank you! World Shelters made great progress in the last few weeks, creating a proposal that meets the criteria set by the Japanese government for transitional shelter. Lots of time and hard work has been put in by our design and engineering teams in order to create the best possible product. World Shelters is very fortunate to be working closely with Kaigai Aviotech, an important leader in the field of avionics in both the US and Japan for over 40 years. Kaigai now represents World Shelters in Japan and will be presenting our collaborative proposal for 1,000, 5,000, or 10,000 shelters for qualification by the Japanese Ministry of Land, Infrastructure, and Transportation this coming week. · has telescoping steel anchors that easily allow for placement on hills. · features an entryway, sliding doors, and other cultural modifications in order to make inhabitants feel as comfortable as possible in their new homes. World Shelters needs and welcomes donations now to provide well-designed transitional shelters for people in Japan displaced by the earthquake and tsunami. We offer our sincere gratitude to everyone supporting our efforts at this critical time. Following the disastrous earthquake and tsunami in Japan, World Shelters has begun looking for and working with partners to help provide safe and reliable transitional shelter to those in need across the Pacific. Because of strict Japanese building codes and ingrained cultural standards of living, we have determined that the rectangular TranShel and TShel2 are the best matched shelters for this situation. After being approached by Kyoto International University, we have begun an initiative in concert with their organization to supply 1,000 TranShel family shelters. We are still working out the details, but hopefully this project is moving forward quickly in order to get those families into adequate shelter as soon as possible. We are also working on a second initiative with a Japanese logistics company who are very interested in providing large numbers of the TShel2, but again, the details are still coming together. Thank to to those of you who have donated – your support makes our work possible and greatly helps those in need of true transitional homes. We have a number of projects currently in place or developing on the ground in Haiti. The first is a partnership with ACTS World Relief, where we were able to provide two 44 ft. diameter steel frame domes with tropical-grade covers and solar-powered vents as well as U-Dome 200s and U-Dome 120s for use by the Eden Garden Orphanage. The site is up and running on Highway 1, just north of Port-Au-Prince, and we look forward to hearing more about how they are putting our domes to great use. 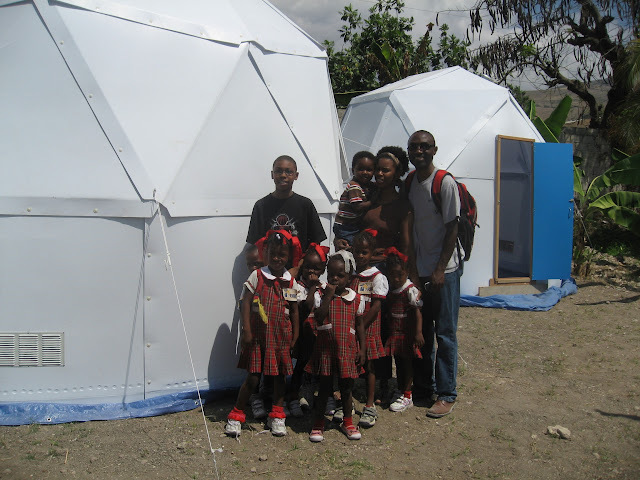 World Shelters has also donated two 44 ft. diameter steel frame domes with tropical-grade covers and solar-powered vents to Mercy Corps, to be used on the ground in Haiti. Together these domes provide over 3,000 square feet of space and have a usable life of 10-12 years. We have also provided them with two of our regular U-Dome 120s. These domes will all be used for a new agricultural community that Mercy Corps is helping to organize, with the two large domes most likely being used as a school and clinic. World Shelters can’t wait to see these domes in action! We also have a field demonstration model of the TShel2 up and available for viewing in the Delmas 33 camp. Hopefully this model can be used to show the space-saving and safety attributes of a 2-story raised platform transitional shelter. World Shelters continues to maintain a presence in Haiti and is optimistic about the possibility of increasing that presence in the future with the right support. World Shelters, in coordination with the Uber Shelter field team, is working to lease a privately-owned parcel of land in a Haitian neighborhood where we hope to erect 10 TShel2s. The lot is currently covered in trash and rubble, but with the innovative raised design of the TShel2 most of that rubble would not need to be moved in order to start building shelters. Each shelter only requires six small holes to be dug where the load-rated footings are anchored in concrete. In addition to building TShel2s on this lot World Shelters hopes to supplement them with solar panels, composting toilets, and water harvesters. These three basic additions will increase the quality of life as well as the safety of inhabitants exponentially, and all three can be added for less than the cost of the shelter itself. For many families in Haiti the home is a woman’s workplace. In order to provide for and support her family, many women must endure harrowing and dangerous situations on a daily basis. The IDP camps harbor a constant threat of violent gangs and numerous instances of sexual violence have been reported, with undoubtedly many more going unreported or unnoticed. Even going to wait in line for clean water carries a risk to personal safety. If a woman can provide for herself and/or her family with electricity and a water tank in the home, not to mention the health and sanitation improvements a composting toilet will bring, there is a much greater opportunity for her to keep herself and, by extension, her children out of harm’s way. It also allows for the possibility of women working outside the home if they are not constantly tied down doing chores, allowing them to be productive members of the larger community as well. If World Shelters was to build a 10-house settlement on this lot, it would create a true community where neighbors could support each other and allow for greater productivity among the settlement as a whole. Residents living in a more permanent neighborhood have greater opportunity to form personal connections and relationships with each other, which it is fair to say increases happiness in the long-term as well as providing possible reciprocal support such as babysitting or communal meals. Each family would need to be at least minimally productive in order to pay the small monthly rental fee, which encourages growth and development not only within the community but in Haiti as a whole, where productive workers are what is going to get the country heading in the right direction. Our plan also looks towards the future, with the Haitian land-owner taking ownership of the 10 units after 36 months so that the entire settlement becomes self-supporting. World Shelters Executive Director Bruce LeBel says, “If the shelter and land (and accessories like water harvesting) can be provided at a monthly price that productive workers can afford to pay, then there’s no need for government grants or agency donations or other largesse.” Our goal is to create an environment where inhabitants can provide for themselves in an economically sustainable manner by nurturing and encouraging productivity. World Shelters is currently in discussions with the Haitian land-owner and developing financing, but is hopeful that this great opportunity will be able to come to fruition. With the generous support of Pacific Domes and hundreds of other donors, World Shelters was able to ship 7,000 square feet of shelter to Haiti last month to meet the expressed needs of Doctors without Borders (Medicins san Frontieres- MSF) and Hopital Adventiste / ACTS World Relief. All relief agencies working in support of Haiti have experienced daunting logistical challenges, including the very complex issue of land clearance. World Shelters’ shipment for Doctors without Borders is currently in Haiti awaiting site clearance. The shipment for ACTS World Relief is currently in Florida awaiting transport to Haiti. For more information on the difficulties of land clearance and logistics within Haiti, please see this Associated Press article. Due to these issues, the World Shelters team has not yet departed for Haiti. As soon as our partner agencies have resolved the issues of land clearance for these installations, we will send our team to erect these structures. The rainy season typically begins on April 1 and we want to provide these facilities as soon as possible. We are working closely with our partnering agencies in order to obtain the necessary land clearance and complete these projects for medical installations as expeditiously as possible. World Shelters has submitted proposals for over 20,000 family shelters in response to multiple agencies’ requests for proposals. Currently little to no land in Haiti is available for siting any of these projects. As new developments arise, we will be updating the World Shelters website with this new information. World Shelters has reached the final stage of competition in the renowned Buckminster Fuller Challenge. World Shelters’ entry “Sheltering U.S. 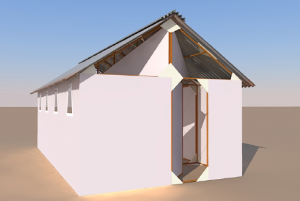 Persons Unsheltered: Creating Legally Conforming, Economically Sustainable Emergency and Transitional Shelter” is one of 30 entries (out of 215) to advance to the final stage of competition for the $100,000 prize. World Shelters’ Initiatives to Haiti. Doctors in the field lack appropriate facilities to treat patients forcing them to perform operations in unsanitary conditions. The World Shelters Trauma Center provides 3,000 sq. ft. of enclosed space This “Field Hospital in a Box” includes cots for 40 patients, a water purification system, power, lighting, fans, refrigeration for meds/vaccines, all together this would create an equipped, sanitary environment for medical procedures. The TranShel transitional shelter, developed to the standards of the Transitional Shelter Consortium, provides both a core house with adaptability into long-term shelter. Through local adaptations and additive construction supported by in-country field programming TranShel can be altered according to cultural context. A family of five can be sheltered per Sphere standards in this 3×6 meter frameless, hard-panel structure complete with door, two opening screened windows and multiple vents. The 18m2 World Shelters TranShel is rapidly available in large volumes, and beyond the initial shelter can create construction jobs through complementary field programming. This inexpensive, versatile frame connector system, when used in conjunction with local or delivered bamboo, roofing and wall membranes, provides 18m2 of covered space. Simple assembly of familiar “3-4-5” truss-roof frame modular design allows World Shelters JAS to be made in multiple sizes. 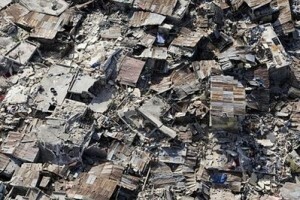 Rubble in Haiti is an insurmountable problem. Building materials are scarce. 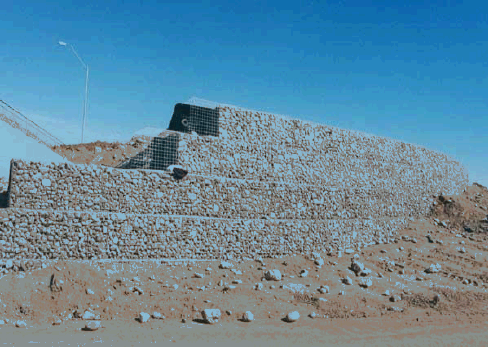 World Shelters Gabions converts the problem of rubble into a resource for constructing walls and retaining walls. 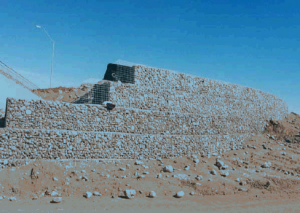 Using galvanized 11-gauge welded wire mesh, measuring 2’ x 2’ x 6’, Gabions utilize rubble to create solid walls a family shelter. After initial container load deliveries, World Shelters sees the opportunity to begin production of gabions in Haiti. 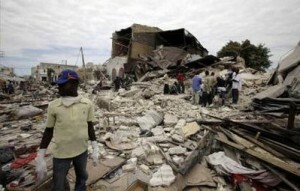 The devastation from the January 12 earthquake in Haiti is horrific. Loss of life and survivors’ injuries are at an unprecedented scale for this region. The extent of building collapse and damage will soon become clearer but is extremely widespread. A significant percentage of homes and commercial/municipal buildings will need to be rebuilt – “built back better”. Many thousands of Haitian families are now without shelter. Beyond the immediate imperative to rescue and provide medical care, food and water for survivors, assistance to Haiti must further the longer-term goals of rebuilding and recovery. Though it has been less than one day since the earthquake as we write this, World Shelters and our collaborating partners are actively developing our projects and evaluating needs based on assessments from the field. Your support of World Shelters’ Haitian relief efforts will provide a maximum value in context-appropriate shelter that will help make the transition towards permanent housing “built back better”. Please click on the link below to see our more extensive write-up. We provide secure online credit card donating through PayPal.